The peaceful methodology which the IPOB Activist has embarked upon is the act of Civil disobedience. To boycott everything boycottable in the contraption. The Nigerian government has been using violent tactic to suppress the outspoken activist against tyranny and Injustice, subjugation and marginalization. Wikipedia definition of civil disobedience: Civil disobedience is the active, professed refusal of a citizen to obey certain laws, demands, orders or commands of a government or occupying international power. 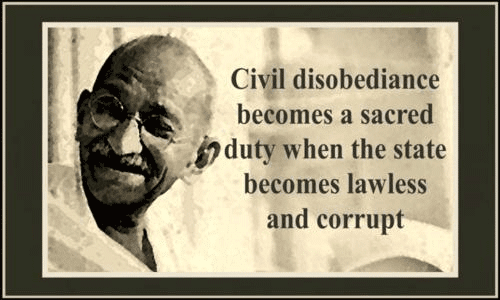 Civil disobedience is sometimes defined as having to be nonviolent to be called civil disobedience. Civil disobedience is sometimes, therefore, equated with nonviolent resistance. Civil disobedience is a moral weapon in the fight for justice, but I guess the question in your mind will be, how can “disobedience” ever be moral? Well I guess that depends on one’s definition of the word. In 1919 in India, ten thousand people gathered, to protest the tyranny of British rule, the top gunning British general, Gen. Reginald Dyle, trapped them in a court yard, and ordered his troops to shoot into the crowd for ten minutes. 379 died! Men, women, children, shot down in cold blood. Dyle said he taught them a moral lesson. Gandhi in his way responded, not with violence, but with an organized campaign of non-cooperation. Government buildings were occupied; streets were blocked by people who refused to rise even when beaten by police. Gandhi was arrested, but the British were soon forced to release him. He called it, a moral victory. The definition of moral, Dyle’s lesson or Gandhi’s victory? You choose! You are right to argue that nothing in law that tramples upon RULE OF LAW can be moral. But not when for 59 years of Nigeria independence, young Nigerian cannot boast of constant power supply; quality education; good healthcare; good road network; efficient security; stable economy, and not when the rich live on the expense of the poor. An unjust law is no law at all. This means I can decide to protect myself as well as my right as a citizen, with violence, or civil disobedience. The Nigerian political elites should understand that Indigenous People Of Biafra (IPOB) led by Mazi Nnamdi Kanu has ordered for a total boycott of 2019 general election if their demands are not ample. We the Indigenous People Of Biafra led by Mazi Nnamdi Kanu will continue to use a nonviolent approach pursuit to our demands until the government of Nigeria do the needful. No more voting in Biafraland until our demands which is a date for referendum is given to us. The Politicians should continue running from pillar to post. We have stated our demands. We are fed up with this useless union. Dissolve Nigeria now and save lives. Nigeria is a crime against humanity. All hail Biafra the children of the light.